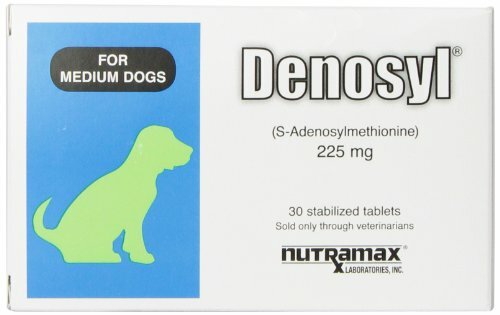 Denosyl is a nutritional supplement that helps minimize a variety of liver problems in dogs. It has also been shown to improve liver health and function by protecting and repairing liver cells. It is recommended to improve hepatic glutathione levels in dogs and cats. For optimal absorption, give your dog or cat Denosyl on an empty stomach, at least an hour before feeding. Denosyl, a nutritional supplement, is the pure and stabilized salt of S-Adenosylmethionine for veterinary use only. It is the only brand researched in medical trials for veterinary use in dogs. S-Adenosylmethionine is an endogenous molecule synthesized by cells throughout the body and is formed from the amino acid methionine and ATP. It is an essential part of three major chemical pathways in the body. Denosyl has been shown to increase hepatic glutathione levels in cats and dogs. Glutathione is a potent antioxidant that protect hepatic (liver) cells from toxins. A study found that low liver glutathione concentrations are common in dog and cats with decreased liver function. For optimal absorption, tablets should be given on an empty stomach, at least 1 hour before feeding, as the presence of food decreases the absorption of S-Adenosylmethionine. 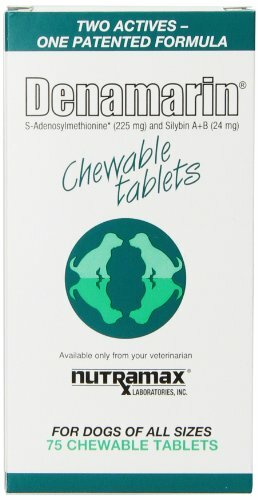 For those owners who have difficulties administering tablets to their pets, this medication may be disguised in a small bite of food. Studies have shown that, in many cases, tablets or capsules given as a "dry swallow" do not pass into the stomach in cats, but may become lodged in the esophagus. It is recommended for pet owners to administer 3-6 cc of water immediately following any tablet administration to speed passage of the tablet into the stomach. 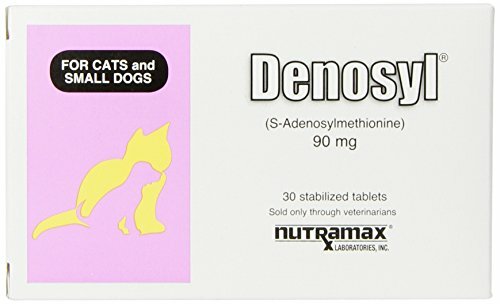 Denosyl 9- mg tablets are ideal for cats because of their small size. 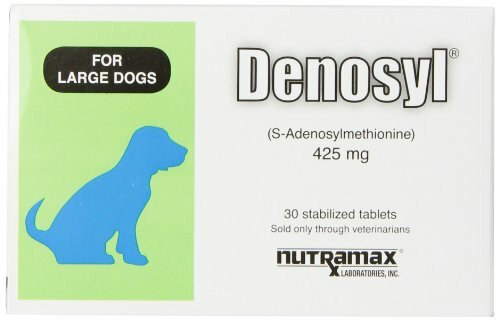 Denosyl is a nutritional supplement that helps minimize a variety of liver problems in dogs and cats. It has also been shown to improve liver health and function by protecting and repairing liver cells. It is recommended to improve hepatic glutathione levels in dogs and cats. For optimal absorption, give your dog or cat Denosyl on an empty stomach, at least an hour before feeding. Denosyl, a nutritional supplement, is the pure and stabilized salt of S-Adenosylmethionine for veterinary use only. It is the only brand researched in medical trials for veterinary use in dogs and cats. S-Adenosylmethionine is an endogenous molecule synthesized by cells throughout the body and is formed from the amino acid methionine and ATP. It is an essential part of three major chemical pathways in the body. Denosyl has been shown to increase hepatic glutathione levels in cats and dogs. Glutathione is a potent antioxidant that protect hepatic (liver) cells from toxins. A study found that low liver glutathione concentrations are common in dog and cats with decreased liver function. For optimal absorption, tablets should be given on an empty stomach, at least 1 hour before feeding, as the presence of food decreases the absorption of S-Adenosylmethionine. For those owners who have difficulties administering tablets to their pets, this medication may be disguised in a small bite of food. Studies have shown that, in many cases, tablets or capsules given as a "dry swallow" do not pass into the stomach in cats, but may become lodged in the esophagus. It is recommended for pet owners to administer 3-6 cc of water immediately following any tablet administration to speed passage of the tablet into the stomach. 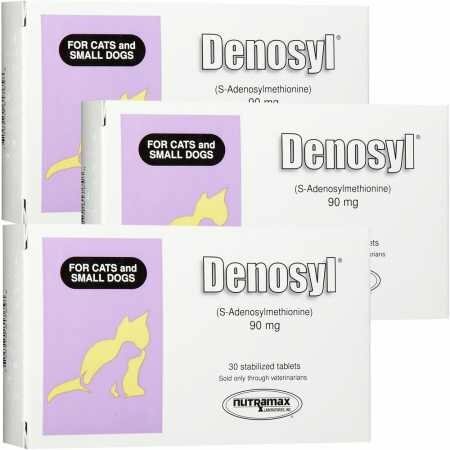 Denosyl 9- mg tablets are ideal for cats because of their small size. S-adenosylmethionine. 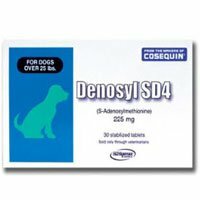 Denosyl has been shown to increase hepatic glutathione levels in cats and dogs. Glutathione is a potent antioxidant that protects liver cells from toxins and death. Denosyl is recommended to improve hepatic glutathione levels in compromised animals to help maintain and protect liver function. The tablets should be given on an empty stomach at least one hour before feeding. The usual dose in cats and dogs is based on weight. For pets up to 12 pounds give 1 tablet of the 90 mg strength. For pets 12 to 25 pounds give 2 tablets of the 90mg strength. When giving more than 1 tablet the total number of tablets may be divided into morning and evening. Eg. A dose of 3 tablets could be divided into 2 tablets in the morning and 1 tablet in the evening. 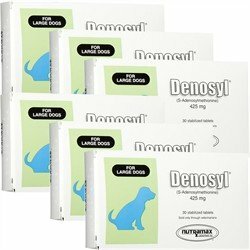 Denosyl is a nutritional supplement that helps minimize a variety of liver problems in dogs and cats. It has also been shown to improve liver health and function by protecting and repairing liver cells. It is recommended to improve hepatic glutathione levels in dogs and cats. For optimal absorption, give your dog or cat Denosyl on an empty stomach, at least an hour before feeding. FELINE AND CANINE DENOSYL SD4 ADMINISTRATION GUIDE Body weight Total daily administration and tablet size Up to 12 pounds (5.5 kg) One tablet of 90 mg 13 to 34 pounds (615.5 kg) One tablet of 225mg 35 to 65 pounds (16 to 29.5 kg) One tablet of 425 mg 66 to 120 pounds (30 to 54.5 kg) Two tablets of 425 mg Over 120 pounds (54.5 kg +) Three tablets of 425 mg The number of tablets can be gradually reduced or may be increased at any time depending on the pet's needs. Marin provides support for the liver with silybin and vitamin E. Marin also contains zinc for additional benefit. 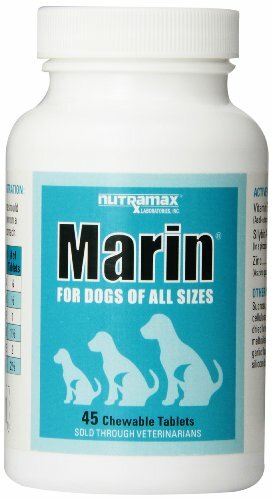 Marin is available in a convenient chewable formulation which provides another option for those pets requiring on-going liver support. Supports healthy levels of glutathione, a powerful antioxidant, and the liver's first line of defense. Use in dogs to help support and maintain healthy liver function. Ideal for aging pets and for providing additional liver support to pets taking NSAIDs for arthritis management. Storage: Store in a cool, dry place. Tablets are sensitive to moisture and extreme heat. It is a stable formulation of same (s-adenosylmethionine), a nutritional supplement for liver and brain support in chewable form. 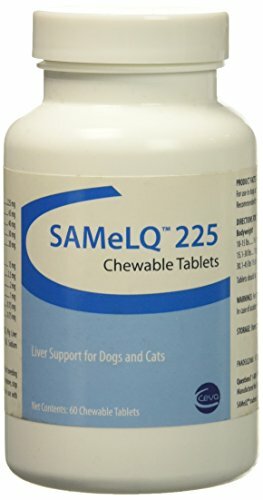 SAMeLQ® Chewable Tablets are formulated to help support normal liver function in dogs and cats. S-adenosyl methionine (SAMe) and n-acetyl L cysteine help support normal detoxification and cleansing of the liver from impurities. Glycyrrhizinate Ammonium (licorice root extract), quercetin and L-taurine are antioxidants which help enhance immune response. The SAMeLQ® Chewable Tablets are readily accepted. Dogs and cats love the great taste. 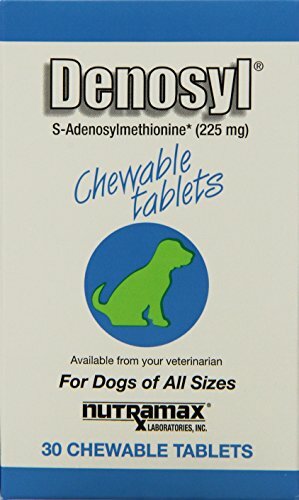 Denosyl helps maintain and protect liver function in dogs. Contains potent antioxidant that protects hepatic cells. Denosyl is recommended to improve hepatic glutathione levels to help maintain and protect liver function.